Israel is such a complex and contradictory country that it is often misunderstood. 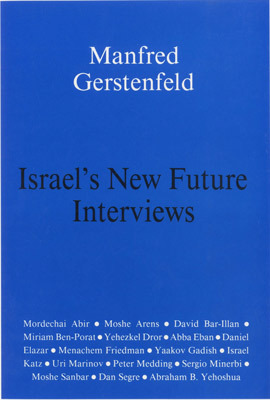 Israel’s New Future – Interviews consists of a series of interviews with Israeli experts and thinkers on important facets of the country’s future. It deals with likely changes, and those considered critical to the country’s development. This book provides a panorama of Israel’s problems and the keys to solving them. It appears at a moment when major taboos of past decades have been broken but new equilibria have not yet been established. Israel and the Arabs may be on the road to peace, but formidable obstacles remain. This is a difficult but very rewarding time to reflect on the future. The subjects reviewed include future relations with the United States, Europe, the Vatican, the Islamic world and Jews abroad; the economic, social, cultural and environmental prospects of the country; and special communities such as ultra-Orthodox and kibbutz societies. The 16 interviewees come from the realms of, among others, politics, government, banking, academia, diplomacy and literature. Dan Segre: Can Israel Ever Trust Europe?